Antalya is one of the most southern resorts on the Turkish coast. It has a climate similar to California that makes it a great destination all year round. Unfortunately, tourism is overdeveloped in certain areas, but there are still some very impressive resorts. For those of us looking for the old part of Turkey, the Kaleici is a good spot to locate yourself. The development of tourism here started due to some of the most beautiful beaches and archaeological sites in the country being located here. Antalya has become a very large resort area and 'Kaleici', which means "inner castle" in Turkish, has tourism to thank for its survival. The careful conversion and restoration of old structures into dwellings or pensions has helped to preserve the original appearance of these fine buildings. The Old City retains a wonderful atmosphere as one meanders through the streets to the port, or sits at one of the wonderful cafes on the castle walls. Except for a few places in the center of the city and the museum (one of the top five in the country), most of the tourist attractions are about an hour's drive outside the city. Gloria Golf Resort is situated in Belek- Antalya set in pine forests at the foot of the Taurus mountains having access to the beach via a bridge over the Ac�su river. Built on a total area of 2.122.000 sqm, Gloria Hotels & Resorts consists of Gloria Golf Resort, Gloria Verde Resort & Spa and 45 hole championship golf course (18 hole Old+9 hole+18 hole New). Our Gloria Golf Club is 1.9 km away from Gloria Golf Resort and complimentary shuttle service is available to our guests. 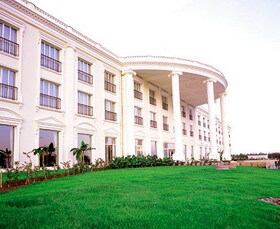 Both of the hotels are connected through a 2.7 km long path road. 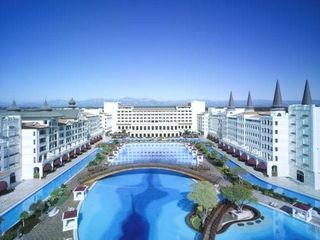 IC Hotels Airport is only 800 m from Airport Antalya has a glance neo classic architecture and magnificent forest view, cool atmosphere, elite personal, varieties of services for the guests, quality as a 5 star hotel connect luxury and comfort with another. NEW OPENED. It is established in the form of antique Ottoman palace. 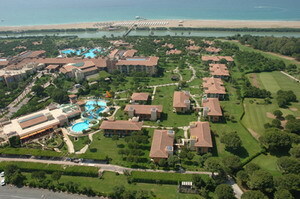 It is located on 180.000 m2 area in Lara, the most famaous beach of Antalya. Mardan Palace's establishment is inspired by Dolmabahce Palace, Galata Bridge, Kuleli and Maiden's Tower. This beautifully adorned hotel is surrounded by the old world charm of the Kaleici. Step inside and you will find the interior design of this hotel is outstanding; it showcases the kind of detail one rarely sees. The finishings are exact replicas of the old Sultan style. Exquisite detail greets you from every angle -- just look at the ceilings as you gaze up from your wonderful, large beds. The garden area is lovely, complete with a pool and very private. Do not miss a visit to the hotel's own pastry shop; its mouthwatering, delicious sweets are simply incredible.